bankmecu landbank - Kowree Farm Tree Group Inc. 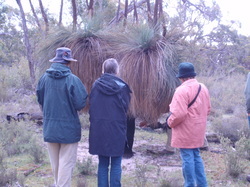 In 2008/2009 The Kowree Farm Tree Group began a partnership with bankmecu (now Bank Australia), Landcare Australia and Trust for Nature to complete re-vegetation work on the Bank Australia Conservation Landbank. This partnership ended in 2016 when Greening Australia took on the project. The Conservation Landbank initiative allows Bank Australia to offset the loss of biodiversity resulting from new homes it finances and the carbon emissions generated by cars it finances. This is done through the purchase and revegetation of marginal farming land (farmland that is unlikely to ever be productive but which has good conservation value). The Kowree Farm Tree Group’s work on the Bank Australia Conservation Landbank began with the purchase of the first Landbank site, at Minimay in Victoria’s West Wimmera region. This 201 hectare property was purchased and protected by a Trust for Nature Conservation Covenant in 2008/2009 and the Kowree Farm Tree Group undertook revegetation work of approximately 60 hectares over several years from 2009, as well as the overall maintenance of the block. The successful revegetation and community involvement generated from the Minimay block lead to the purchase of more properties. Since 2008, Bank Australia has purchased 927 hectares of land spread across five properties situated in Victoria's West Wimmera region. This land has been set aside to help protect remnant natural forest and restore degraded farmland. These blocks began the revegetation process through a partnership between Landcare Australia, Trust for Nature and the Kowree Farm Tree Group. The role the Kowree Farm Tree Group played in the Conservation Landbank was to oversee the revegetation work. This involves clearing the block of old fences and rubbish, surveying and controlling pests and weeds, surveying the blocks for vegetation types, collecting seed and arranging propagation, organising direct seeding and planting of trees. This work is done in consultation with Bank Australia, Landcare Australia and Trust for Nature. Every year throughout the project 80 hectares were planted with trees; 20,000 seedlings on 40 hectares and direct seeding across the rest. These trees are local native species, and as well as sequestering carbon to offset loans, they provide valuable habitat for the endangered Red-tailed Black Cockatoo and other native wildlife. 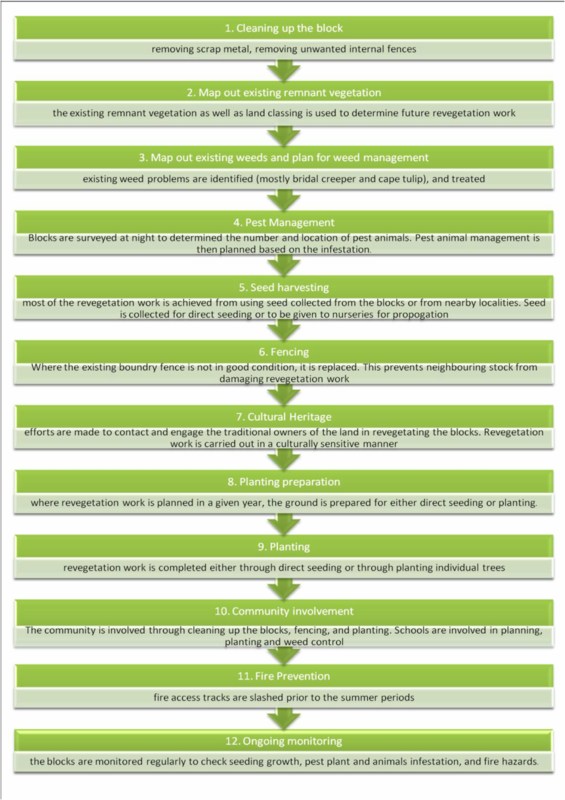 The community was involved in many different ways throughout the revegetation process. Community clubs and groups were engaged for work such as cleaning up the blocks, fencing and planting. This work contributes to the clubs yearly fundraising and therefore the revegetation work benefitted the community as a whole. The activity was a brilliant initiative that brought money into the community from an outside organisation; about $10,000 each year. Schools were also involved in planning, planting and weed control at both primary and secondary levels.